I happened upon a handsome candle today. I first noticed it on the shelf, with the little silver shield on the front gleaming. It had a commanding presence surrounded by some punier candles. I picked it up and felt that it was heavy with a thick glass jar. When I turned the candle box over I saw that it was made in the USA, and I was impressed. 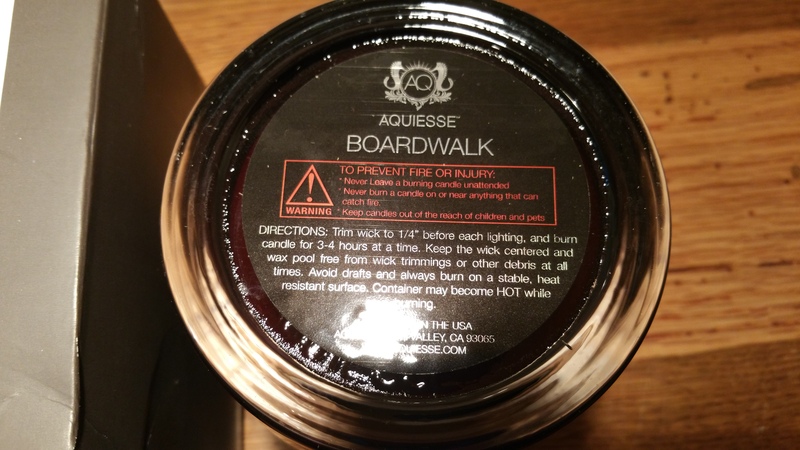 It’s name is Aquiesse No 017 Boardwalk, and is described as “surf & sand; spun sugar; caramel & drift wood.” I like all of those things, although I’ve never thought about caramel and drift wood in the same sentence. But I decided to take it home anyway. I’ll admit, I had never heard of or seen anything from Aquiesse so I had to do some research. I discovered that Aquiesse is not a brand new company, but that I’ve just had my head in the sand, (under the boardwalk), so to speak. I found a whole list of Aquiesse candles and other home fragrance options on Amazon, which is often the most convenient place for me to shop. I like that their candles are luxe but not as expensive as Diptyque or Jo Malone. ($36 for 10 oz Aquiesse candle v. $90 for 10.2 oz Diptyque candle and $65 for a 6.7 oz Jo Malone candle). 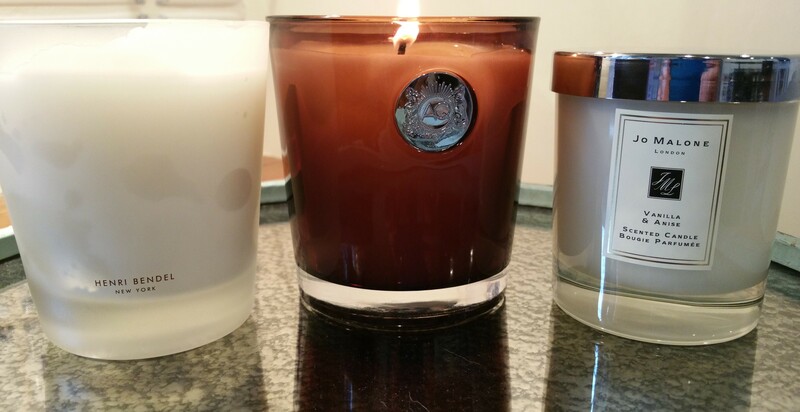 Other candles I like in the middle priced category are from Henri Bendel and Tocca, both of which have impressed me for years. My favorites of each are Henri Bendel Vanilla Bean and Tocca Yma. 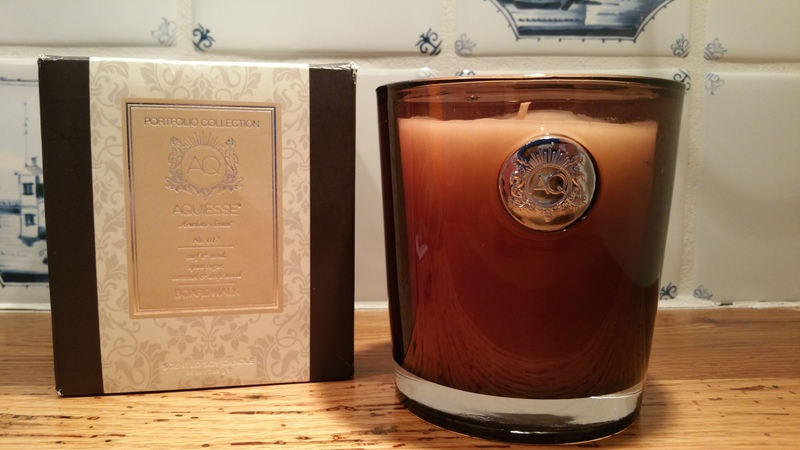 (approx $30 for 9.4 oz Henri Bendel and $38 for 10.6 oz Tocca candle). Tocca seems to do fruity scents particularly well. I found Tocca years ago at Sephora, in a tocca candle set. Stella (blood orange) was my immediate favorite, and for a long time I collected Tocca Stella candles and put half burned ones in my drawers to scent my clothes. As Tocca became more available in the US, I found Yma, smelling of red currant. Yma is really an original. It’s palpably juicy and delicious. Another fruity Tocca scent I like is the watermelon scented Tocca Isabella, although it doesn’t mimic ripe fruit as well as Yma. Each of Bendel Vanilla Bean and Tocca Yma deserve their own posts. I’ll just say that I find them so fabulous that they could carry their respective brands on their individual merits. Meanwhile, I still have Aquiesse burning in the background and I’m ready to tell you what I think. I’ll qualify this by reminding you I’ve only smelled one candle from Aquiesse, but this one has me a bit disappointed. While I still love it for the way it looks, it seems to melt down a little too fast and throws off a single note of sugar or waffle cone, without much complexity. Whereas Bendel’s Vanilla Bean is a sophisticated mix of notes that you can pick out if you try, Boardwalk comes off as kind of fake and flat. I imagine the scent as how a teenage girl’s fragranced body mist would smell when she spritzes it on after gym class. Overall, it’s not one I’d buy again. But I am willing to give Aquiesse another try. I think I’ll opt for something very different, like White Tea Mint. Now, I’d really like to know if you’ve tried Aquiesse. What mid-priced luxury candles do you like? My world is only as large as what I can see, and I’d like to expand that view!